How to Uninstall Updates in Windows 10/8/7 OS. This tutorial contains detailed instructions on how you can uninstall updates in Windows 10, 8 & 7 Operating Systems. As you have already noticed, Windows forces the automatic installation of all updates in order to keep your system healthy and secure. This is a good procedure, because your system is always updated. But, in some PC's, a Windows update or a driver update can make the system unstable after its installation. For that reason, there is the need to uninstall that update, in order to regain the system's stability back. How to Remove Windows Update(s). 1. Simultaneously press the Windows + R keys to open run command box. 2. 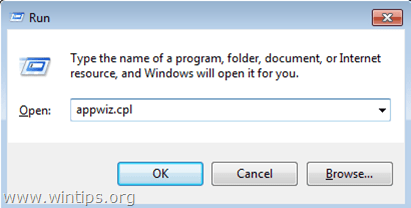 In run command box, type: appwiz.cpl and press Enter. 2. Click View installed updates on the left pane. 3. Click at 'Installed On' to sort the installed updates, by the installation date. * Tip: If you know the KB number of the update that you want to remove (e.g. "KB4093118"), then you can easy find that specific update, by typing its KB number on the 'Search installed updates' field. 5. When the update removal is completed, then proceed and prevent the installation of the removed update in the future. « FIX: Dell Laptop Needs the Bitlocker Recovery key (Solved). » How to Prevent the Installation of a Windows 10 Update.